This is the new Chevrolet Captiva that’s making its debut at the 2019 Bangkok International Motor Show. Replacing the original Captiva that first surfaced in 2006 (facelifted in 2010), this second-generation SUV will go on sale in the second half of 2019 in Thailand at a starting price of below one million baht (RM128,175), which will make it among the most affordable C-segment SUVs in town. “The all-new Captiva is positioned to overlap the fast-growing SUV-B and SUV-C segments. Captiva will be especially attractive for customers looking to get into their first SUV, offering expressive style, life-sized space and smart technology, all wrapped in a smart-value package,” said Piyanuch Chaturaphat, sales and marketing director at Chevrolet Sales Thailand. If you’re wondering how General Motors pulled this off, the new Captiva is basically a rebadged Baojun 530 from China, which was launched last month in Indonesia as the Wuling Almaz. Both Baojun and Wuling in Indonesia are joint ventures between GM and China’s SAIC Motor. Besides making cars for GM in China, SAIC owns brands such as MG and Maxus. If you’ve seen this before, it might be from our GIIAS 2018 coverage. “Our strategy to focus on trucks and SUVs continues to pay dividends and reflects GM’s global emphasis on these key growth segments. We’re now taking the next step in our long-term strategy to grow our local vehicle portfolio by leveraging the global scale and partnerships of General Motors, starting with the all-new Captiva,” Chaturaphat explained. GM says that the new Captiva will offer one of the largest interiors in the market, and will available in five- and seven-seat configurations. Available equipment will include a panoramic sunroof and integrated LED headlights, among other things. Full pricing and detailed specs will be announced closer to launch. The showcar’s interior is not accessible and the windows are heavily tinted. Word is that the new Captiva will be powered by a 1.5 litre downsized turbo engine and six-speed torque converter automatic in Thailand. The same engine makes 140 hp/250 Nm in the Wuling Almaz, but the Indonesian car has a CVT auto. The new Captiva is a big car – at 4,655 mm long and 1,836 mm wide, it’s 71 mm longer than a Honda CR-V, and its 2,750 mm wheelbase is also 90 mm longer. As mentioned, it will come with a third row option in Thailand. In Indonesia, the five-seater Wuling Almaz is priced at 318.8 million rupiah (RM91,417). Unlike the outgoing car, the new Captiva will not be made in Thailand, which means it will be imported from either China or Indonesia. What do you think of the new Chevrolet Captiva alongside the Honda CR-V, Mazda CX-5 and Proton X70? 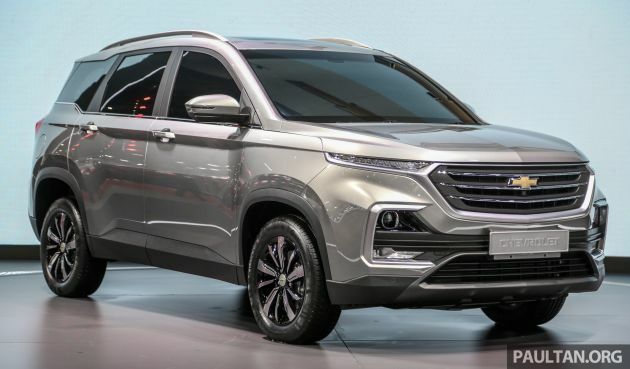 The post Bangkok 2019: New Chevrolet Captiva is a rebadged Baojun 530, Wuling Almaz – below 1m baht, 5/7 seats appeared first on Paul Tan's Automotive News. 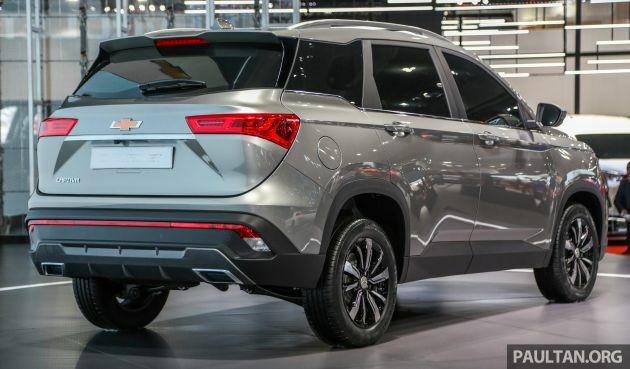 0 Response to "Bangkok 2019: New Chevrolet Captiva is a rebadged Baojun 530, Wuling Almaz – below 1m baht, 5/7 seats"